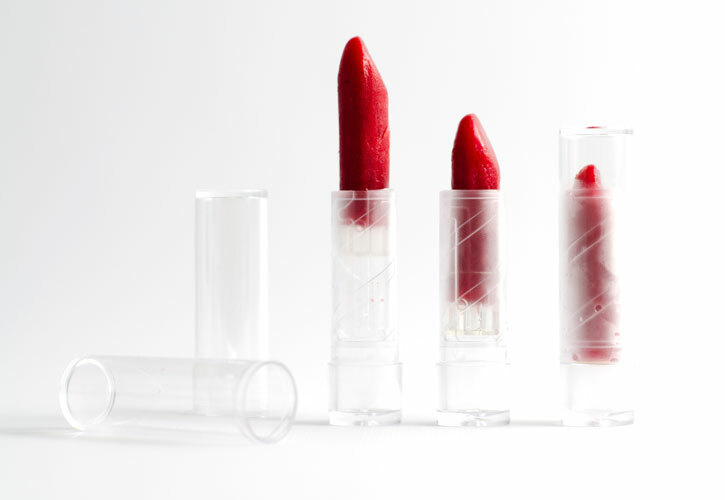 Edible lipsticks are fun and easy to make. First introduced in modernist cuisine by Chef Jordi Cruz at his 2 Michelin Star restaurant ABaC, the edible lipstick of raspberry popsicle is served as part of the delicious petit fours. A great fun way to end the meal. Lucky you! In our store we have the same lipstick molds and translucent retractable bar holders Chef Cruz got made for his restaurant (get Lipstick Mold Kit). 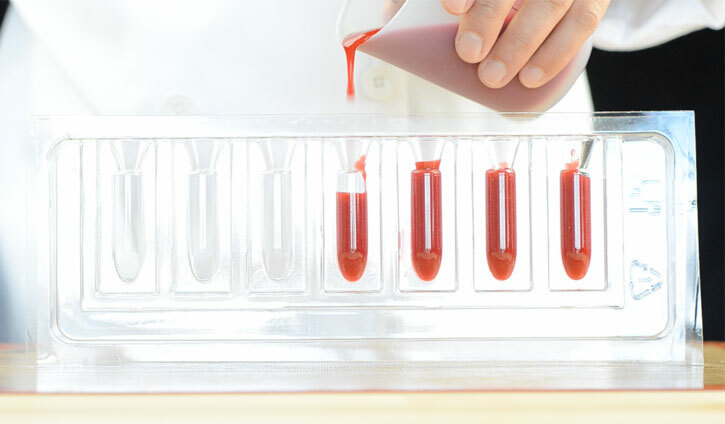 You can not only make edible lipsticks with fruit puree but also with gelatin, agar agar, chocolate, sorbet and cocoa butter. Watch the video below and have some fun! 1- Blend all ingredients thoroughly. 2- Pass mixture through a fine sieve to remove all raspberry seeds and make it smooth. 3- Fill the lipstick bar mold. 4- Place mold in the freezer overnight. Your puree may leak a little through the mold but don't worry, this is normal with this type of mold. 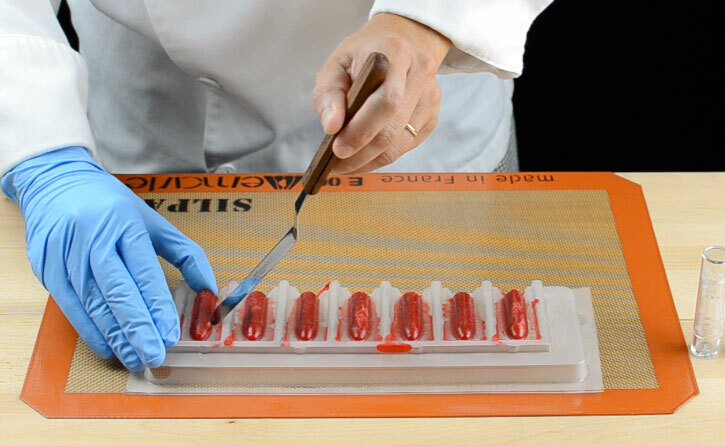 5- Open mold and remove frozen lipstick bars and plate them in the retractable lipstick bar holder. 6- Serve immediately or store in the freezer. 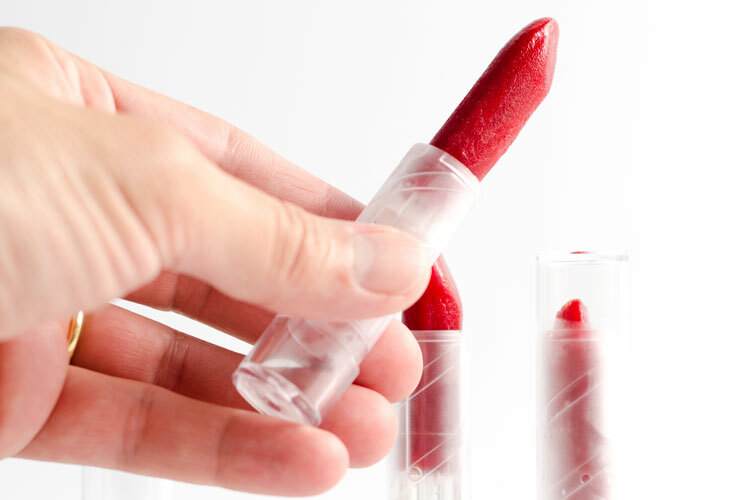 TIP 1: to remove the lipstick bars from the mold, wear rubber gloves to reduce melting by the heat of your hand. It helps to push the lipstick bar from the bottom, it will pop out of the mold easily. TIP 2: you'll see some marks from the mold on the sides of the lipstick bars. To remove them and end up with a smooth finish, slide your fingers from the top to the bottom while you are placing the lipstick bar in the retractable bar holder.